At this very time last year I posted a recipe for a sauce using nannyberries or viburnum lentago. It was my first experience with this berry, and I was surprised at just how easy to use and tasty it was. In that post, I give some description of the plant which I won’t repeat here, but if you think you might have access to this plant, you might find it interesting. 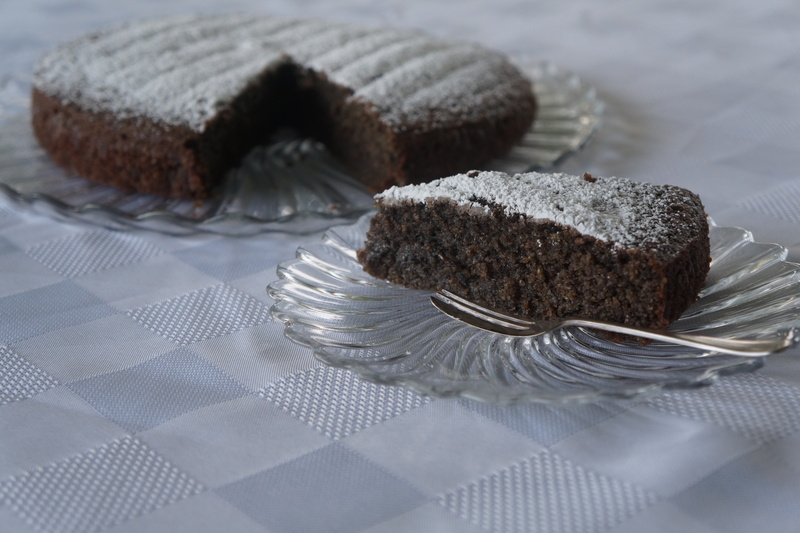 This year the trees are producing even more than last year, and I hope to try a few recipes with them, starting with one for a cake. There are no nannyberry cake recipes I can find, so here is my chance to create a ‘first’. It is a pretty standard, old-fashioned sort of cake recipe, using butter, eggs and buttermilk, but the subtle fruit flavour of these berries, something like that of plums, mixed with cardamom, makes a super aromatic dessert appropriate for an autumn menu. If you don’t care for or own any cardamom, cinnamon could be substituted. Cook the nannyberries and water in a covered pan until soft, about ten minutes. Strain the berries, pressing out as much pulp as possible. This will make about 1/2 cup of juice. When cool, beat in the eggs, buttermilk and vanilla. In a separate bowl, cream the butter and sugar. Measure the flour, flaxseed, soda and cardamom and mix well. Blend one third of the dry ingredients into the butter mixture at a time, alternating with half the liquid. When it is all blended, fold in the egg whites. Pour the batter into a ten inch spring form pan lined with parchment paper. Bake at 325 degrees F for fifty minutes. 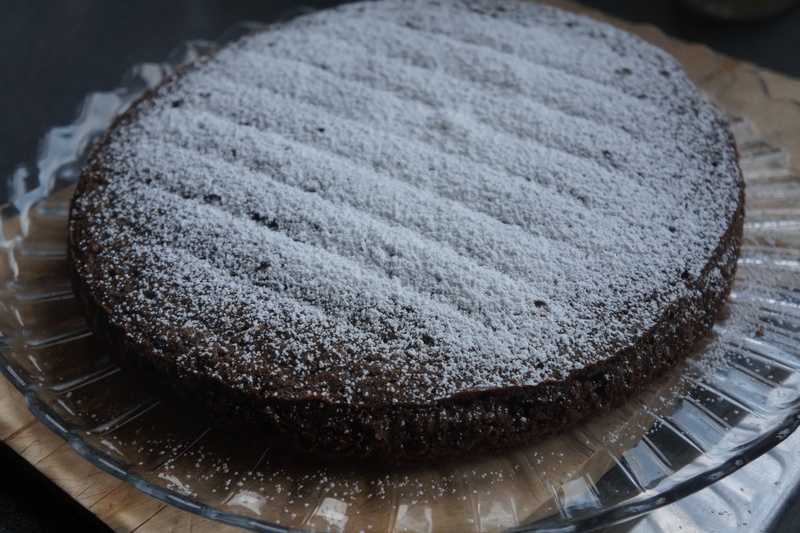 Allow it to sit for ten minutes, then remove the cake from the pan and allow to cool on a rack. This is a cake which can be served just as is, with cream or ice cream, or if you like given a full regalia. Linked to Fiesta Friday #87. Categories: baking, dessert | Tags: cake, cardamom, Fiesta Friday, local food, nannyberries, viburnum lentago, wild berries | Permalink. I first took note of a prickly ash (zanthoxylum americanum) tree last spring when I noticed the cluster of green berries had a very enticing aroma. I had to find out what this bushy plant was before I tasted it, and when I identified it I learned it is not only edible, but a common ingredient in Chinese cuisine known as Szechwan pepper. Assuming the berries had to ripen before harvesting, I only recently got around to collecting a few and was keen to try cooking with them. What I didn’t realize was that the berries can be harvested any time there are leaves present, i.e. from mid-spring to late fall, so green, red, dark blue or black, they are all good. First, a little about this tree or shrub. It grows mostly in shaded woods throughout much of central and north-eastern North America. There are closely related species elsewhere, such as the zanthoxylum bungeanum which is the one used in China and which has a similar taste. The plant can grow anywhere from 9 to 18 feet in height, and is usually part of a larger thicket. A few of the berries I picked were still red, most were black, and many husks had lost their seeds but can be collected all the same. I tasted some of the berries right off the tree. I was surprised by the flavour and the effect of eating them raw. A mixture of lemon and pepper was at first pleasant, followed by a numbing of lips and tongue – and I now understand why one of the many medicinal uses of this is for ‘dry mouth’. I found the experience slightly alarming, but hoped that roasting and/or cooking would eliminate the unpleasant effect but not the flavour. For my first experiment, I decided to just grind one teaspoon of the berries coarsely and then roast them lightly in a skillet. I decided to pair them with nothing stronger than olive oil and crushed garlic, all of which I mixed together into a paste. I then applied a liberal coating to about one pound of chicken breast and roasted it. The flavour was as expected – citrussy and peppery and none of the anaesthetic or salivating effects were felt. I could have used a smaller amount and the flavour would still have been enough, but you will have to experiment a little yourself to find the right proportions for your palate. I believe with the addition of other spices, like cumin, ginger root, anise or chilis, a delicious ‘masala’ could be achieved. I also roasted and ground some (a very small amount) and mixed it with ground dried garlic to season vegetables to be roasted. This method gave a very subtle flavour, a welcome alternative to black pepper (which does not grow in my backyard). With enough berries to keep me going for the winter, I will work on different spice mixtures using this newly discovered spice, and come spring I will be sure to start gathering them much earlier. One word of caution though. These shrubs or trees are as the name suggests – very prickly. They are not difficult to pick and you can collect several in your hand at a time just be clutching a bunch, but dress to protect yourself from the thorns. Categories: edible weeds, spices | Tags: chicken breast, foraging, prickly ash, roasted vegetables, Szechwan pepper, wild berries, zanthoxylum americanum | Permalink. I spotted a few chockecherry (prunus virginiana) trees in the spring near our house with their early white blossoms and determined then that this year I would watch for the berries to appear later in the year. This is the now the height of the season, but you have to be fast as the birds are fond of them, and have a distinct advantage over us in harvesting them. 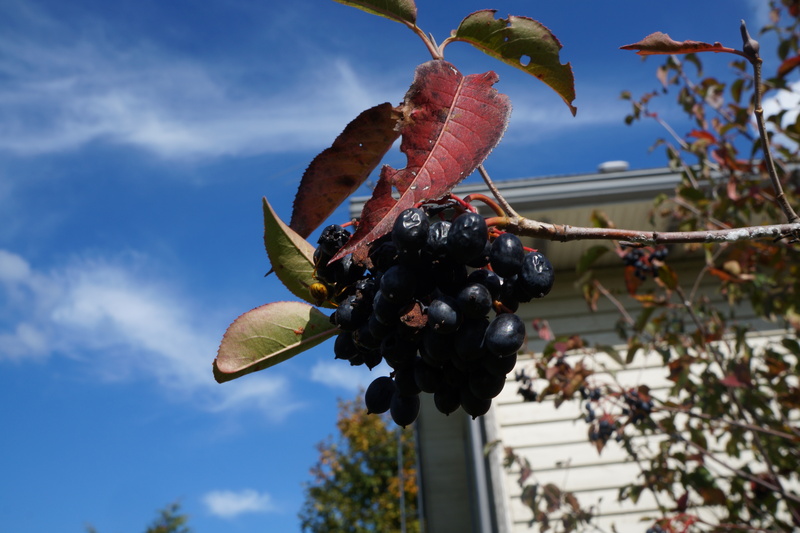 The berries start out red, but should not be picked until they have turned very dark – almost black and starting to shrivel. The flavour is that of a cherry, but somewhat more astringent, and this astringency decreases with age, and again with cooking. They are much smaller than regular cherries, and have a higher proportion of seed to fruit, but they are so easy to pick so you can still get lots of pulp from them. To identify them, look for oval leaves with serrated edges. The leaf is dark with a lighter underside. The berries hang in cluster off reddish stems. They are popular not only with birds but also caterpillars. If you have these trees on your property, you should check for tent caterpillars and remove them. The fruit is high in antioxidants and has many uses. Jams, jellies, syrups and wine are the most common, but they can also be dried, seeds and all, and ground into a flour. This is one of the ingredients of pemican, but I’m sure in modern-day cooking we can find other uses. As I was only able to collect a small amount of berries and have never used them before, I decided to make a simple jelly. I had two cups of berries. I covered them with water in a pan and simmered them until soft. Then I strained them through a food mill. I returned the pulp to the pan, added more water to cover and repeated cooking and straining process. I ended up with 2 cups of juice, to which I added 2 cups of sugar. After bringing it to a full rolling boil, I added one 57 gram package of Certo pectin and allowed to boil 2 more minutes, then poured into 6 sterilized 100 ml. jars with a little to spare. Serving it on fresh scones with clotted or whipped cream or plain yogurt is just one of the ways this rich jelly can be enjoyed. Categories: jams and jellies, recipes | Tags: berries, chockecherries, foraging, jelly | Permalink. This post is inspired by a recent recipe posted by BubblyBEE in which she not only makes a delicious carrot greens pesto, but discusses many other ingredients that can be used besides the popular basil and pine nut variety. I have made the carrot version before, but overlooked the use of mint and purslane (portulaca oleracea)- two ingredients I have in spades growing right near my back door. I usually follow a simple method for pesto – some herbs or greens, garlic, usually walnuts and olive oil. Cheese can be added when served, but if the pesto is not good without cheese, then it is not worth making, so my basic pest contains no cheese. 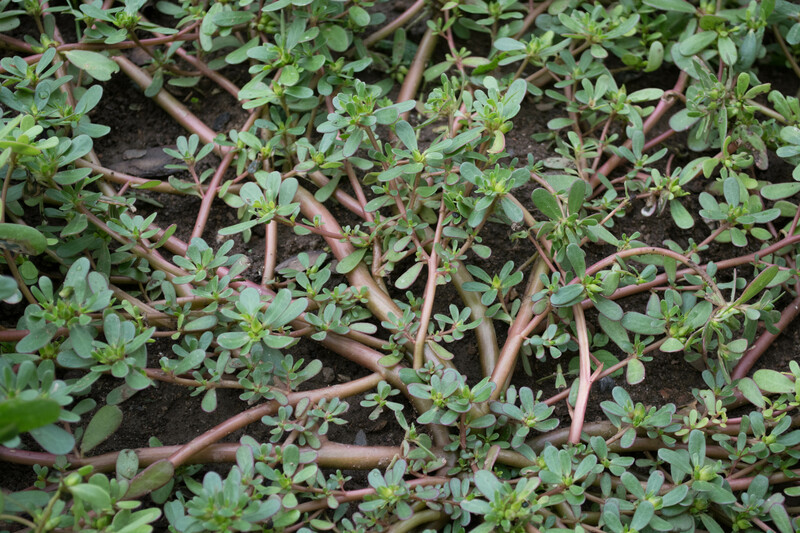 If you are not familiar with purslane, it is one of the gems of the weed world. It contains, among many other nutrients, omega 3 fatty acids which makes it a good addition to a vegetarian diet. For more information of food value, identification and what to do with it, check out this article. My only complaint with this weed is that I never have quite enough of it. I do see it everywhere, but often in public places like sidewalks and parking lots where hygiene is a concern. It does grow in bare spots in my lawn and gardens, but easily gets crowded out obscured by bushier plants. My attempts to cultivate it have not worked out too well. However, I do have a few patches, and will use every bit I can. The entire plant is edible, even after it has started to flower. The stems can grow to be several inches long, and the entire stem, leaves and flowers can be used. it is crunchy and has a mild citrus flavour – perfect for salads and garnishes. For my pesto I used 2 cups each of mint and purslane, 2 cloves of garlic, 1 tsp salt, 1 1/2 cup walnuts and 1/4 cup olive oil. Process in a blender until a good consistency and it’s done! Serve it with pasta, on pizzas, crackers or in sandwiches. Linked to Fiesta Friday #85 hosted by Angie @ The Novice Gardener and co-hosted by Kaila @ GF Life 24/7 and Jenny @ Dragonfly Home Recipes. Related posts: Gazpacho with purslane; Waldorf salad with purslane; Purslane and cabbage salad. Categories: edible weeds | Tags: Fiesta Friday, foraging, mint, pesto, purslane, vegan, walnuts | Permalink. There are few, or maybe even no mushrooms which are easier to identify than puffball mushrooms. It is the perfect species for the non-expert like myself. However, foraging for mushrooms always requires caution, and this is no exception. So here are a few tips on how to identify puffballs with impunity. There are several types of puffballs, but I am describing here the calvatea gigantea so as not to create confusion and because that’s what I find around here and have experience with. Where they grow: In meadows, fields and deciduous forests. What they look like: Completely spherical and white when immature. They have no stems or gills, but are connected to the ground by narrow string-like roots. They are soft and like a spongy bread in texture. When to pick them: Once mature, they are no longer edible. When too small, you could confuse them with other mushrooms. They should be grapefruit size or larger, but still be completely white inside and out. What to watch for: Any yellowing, development of spores or a mushroom cap developing. Do not eat any of these. Look-alikes: poisonous earthballs which are hard and have a blackish interior. If you are lucky enough to have any of these fine specimens accessible to you, there are several ways you can prepare them. Sauteed, cooked in stews, soups or casseroles, and even added to breads or grain dishes. They have a delicious but mild earthy flavour. Be forewarned however that, if frying, they will absorb a lot of oil and become soggy, so it is best to fry quickly with just a little oil brushed on them. I decided to fry some lightly. I sliced them, brushed them on both sides with a mixture of olive oil, salt, garlic and sumac, then browned them in a pan quickly on a high heat. These are delicious on their own, as a side dish or added to a sandwich. However, I used them for a brunch dish as a crepe filling. I added them to fried onions, herbs and seasonings and enough plain yogurt (or sour cream) to make a sauce. If needed, add a little thickener such as cornstarch. Fill the prepared crepes (any kind), fold, cover with grated cheese and broil until the cheese is melted and slightly browned. Categories: foraging, mushrooms | Tags: crepes, Fiesta Friday, foraging, mushrooms, puffballs | Permalink. As promised in my last post, I have been working on a goldenrod drink suitable for after five. The flavour of the tea really is hearty enough that I knew it could stand up to other ingredients without being lost in the mix. A whiskey based drink seemed just the thing. Using the same infusion as I used for the goldenrod tea, 1/4 cup flower and leaf mixture to 1 cup boiling water, I experimented a bit. The interesting thing was that while the goldenrod gave a distinctive herby flavour, the flavour of the whiskey came through very nicely. My conclusion is that a strong flavoured whiskey should be used where you can appreciate its taste, in this case Jack Daniels. My other experiment involved a Canadian whiskey, Forty Creek, but the whiskey was overpowered by the flower mixture, so I added 1/2 ounce of orange liqueur to make up for the weakness of flavour. Not bad, but the first attempt was definitely better. For two tall glasses I mixed 2 tbsp honey, 1 cup of goldenrod tea, 2 ounces whiskey and shook (or stirred) vigorously. I poured that into the two glasses and topped it up with soda water. A couple of ice cubes (which contained some goldenrod florets) and a new favourite drink of mine was born. I have always enjoyed cocktails using foraged plants, either ones I’ve made myself or found in those rare establishments that specialize in local fare. There is something about the bitter and sweet combination along with the complementary earthy flavours of the alcohol and flora that make a very satisfying drink.